I replaced the fuel line on my Huskvarna 142 chainsaw because the original fuel line was old and brittle. This new line was an exact replacement and easy to install. This product is exact fit for my trimmer. worked very well. Just what I ordered!! Will do business again for sure!! work great easy to install.extra long so you haveenough if you make a mistake. Fits my chainsaw exactly. Food price and fast shipping. 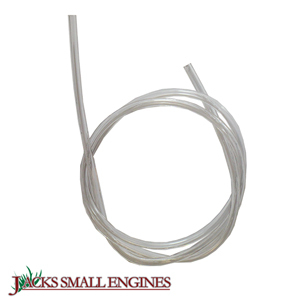 Ask us about the Husqvarna 530069247 Fuel Line. Please no repair questions. Your Q&A may be posted to Jackssmallengines.com to help other shoppers, like you, with their purchasing decisions. Thank you. Ted, the length of this fuel line is 3.56 mm x 2.03 mm. What is the Id. / od. of this fuel line? Matt, the inner diameter is 2/16" and the outer diameter is 3/16".